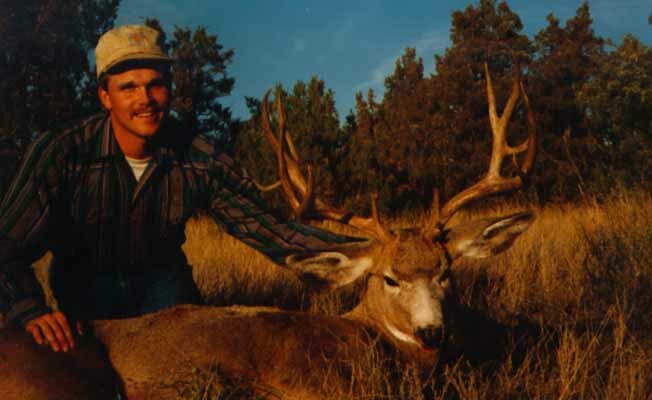 Hidden Valley Outfitters specializes in mule deer, antelope, and whitetail deer hunts for the rifleman, muzzleloader, and archery enthusiasts. Located in eastern Montana, our hunts take place on private property, offering you a high percentage of success taking that fine trophy animal. We pride ourselves in offering to you that great Montana spirit of friendliness and the best in good food and accommodations. Our goal is to make your trip and hunt a memorable one for years to come. Our deer hunts take place on terrain that varies from dry, rolling grasslands to rough canyons with cuts and pockets of brush and trees. There are also open fields of grain and meadows of hay that lead to patchy and heavy pine and cedar trees. The outside spread on mule deer antlers ranges from 20 - 30 inches, with the whitetail scoring 120 - 160 B. C. points. Our antelope hunt is a western big game hunt that everyone must do at least once. The early October weather offers lots of fun and action at an affordable price, with the average buck just over fourteen inches. Our combination mule deer and antelope hunt is a great first-time hunt with lots of action and high success for both species. This is your opportunity to take two North American big game animals in one trip. Our archery hunt is in September and October, and our rifle hunt is in October and November. All hunts are guided, with group packages available. Montana licenses are sold out by March 15, so plan early and book a hunt anytime throughout the year to receive the dates you want. For further booking or hunting information, call 406-795-8286. Hidden Valley Outfitters also provides elk, black bear and mountain lion hunts in the Lewis and Clark Nation Forest near Judith Gap. We can provide guaranteed licenses for all species. We do archery and rifle elk hunts from our base camp of two cabins. Black bears are plentiful and we have a great population of color phase bears as well. The mountain lion hunting is exceptional with a good number of lions in this area.